People queue outside a government employment office in Burgos. 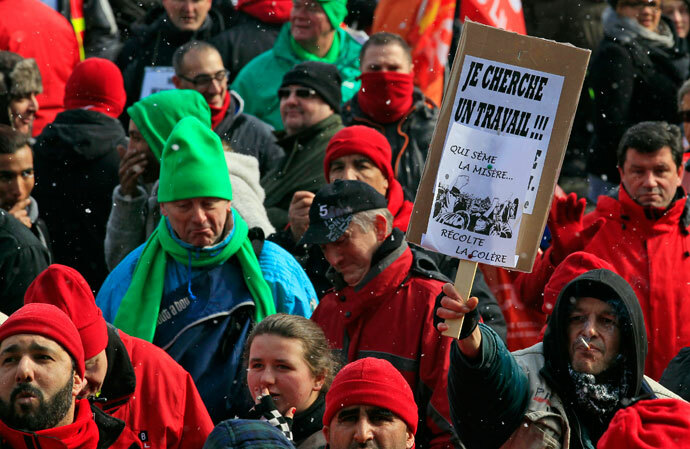 Workers and trade union representatives from all over Europe hold a demonstration against austerity near the European Commission and Council headquarters in Brussels March 14, 2013. Within the last two weeks, Markit’s chief economist Chris Williamson aired serious concerns to AFP. “Instead of the eurozone economy stabilizing in the second quarter, as many – including the ECB – have been hoping to see, the downturn could therefore intensify in coming months,” he said, expressing unease over the prospect. “While in some respects it is reassuring to see the events in Cyprus did not cause an immediate impact on business activity, the concern is that the latest chapter in the region’s crisis will have hit demand further in April,” Chris Williamson told Reuters on Tuesday.